The Holleys Charity dates from 1699 when Benjamin Holley and others left funds to provide land in trust, the income from which was for 'the relief of the industrious poor of the village'. Originally the relief was in kind and coal was distributed at Christmas. The Charity's records show that during the period 1968 to 1971 the Charity purchased and distributed between 7 and 8 tons of coal each winter! The Charity was registered with the Charity Commission on 22nd September, 1962 and is currently administered by three Trustees, all of whom live in Holme-next-the-Sea village. The Commission publishes certain details of all registered charities and you can view the information held for the Holleys Charity by visiting The Charity Commission website and entering the Charity's registered number, which is 207554, into the Charity Search box. 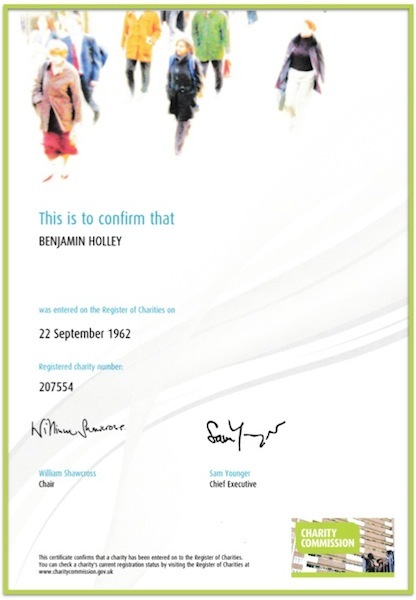 The Certificate shows the original registered name of the Charity as 'Benjamin Holley" but the working title, used by The Charity Commission, is 'Holleys Charity'. In May every year, at the Annual Parish Meeting held in the Village Hall, the chair of the Trustees delivers a brief report to the parishioners on the state of affairs of the Holleys Charity - but obviously no confidential details are given. All parishioners are encouraged to attend this informative meeting. If you know of anyone living in Holme-next-the-Sea who you think could be helped by the Charity please do get in touch with the Trustees who would be very pleased to consider any suggestions. or by telephone on 01485 525149.